At General Gun & Supply you can try shooting a gun with no license or experience! We run a walk in program that allows people to try shooting under the supervision of one our licensed range officers. Feed that desire to come and try a Glock pistol or an AR15 rifle! We operate on a walk-in, first-come, first serve basis, pending availability of Range Officers and space on the range. Please be aware that weekends are extremely busy. Depending on how many people are waiting in line, you might not be able to get on the range. We strongly recommend you call ahead the day of your visit to check on availability at (519) 250-8048. All persons attending General Gun & Supply/Windsor Action Pistol Club must fill out the waiver form if they plan to set foot on the range at all. Canadian Residents: We will only accept government issued photo ID with proof of address (ie. Driver`s License or Ontario ID Card, Passport). International travelers: Please bring your passport with you as form of ID. Reservations are available with our GROUP BOOKING Package. Please be advised that we need a few weeks warning and there is a non-refundable deposit required if there are cancellations. $50.00 + tax per shooter for 20 rounds of 9mm or .223. $100.00 + tax per shooter for 50 rounds of 9mm. 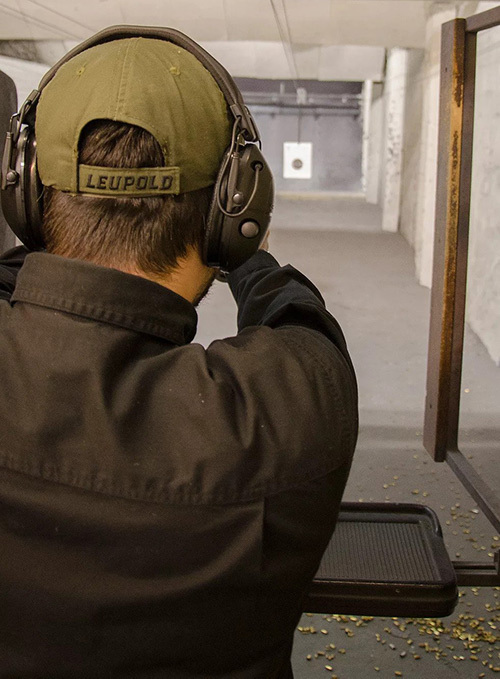 Read & sign Windsor Shooting Experience Waiver (PHOTO ID MUST BE SHOWN). Then there will be a short safety briefing including the range rules. All safety equipment is provided! Each person is then individually shown the correct handling of the firearms and will shoot under the direct supervision of a Range Officer. Shooters will be coached on correct style and technique, our emphasis is for the shooters to have fun in a safe atmosphere. We encourage coverage of the neck/cleavage area while shooting in case of stray bullet casings. A ball cap is recommended for everyone to keep hot casings away from the face area. Sandals, flip flops, and heels are not permitted. Enclosed shoes are mandatory for your safety. Shop from our selection of over 700 firearms and accessories. Order From General Gun & Supply any day of the week!